The doctors call it “UCLR” – ulnar collateral ligament reconstruction. The Baseball community call it Tommy John Surgery. I call it the resurrection of my career. 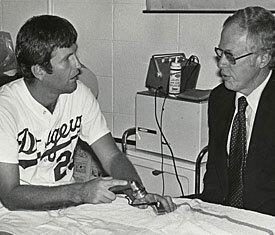 Dr. Frank Jobe introduced the world to his experimental procedure in 1974 on the one and only Tommy John. The UCL is the ligament that creates the stability which allows the high-stress action of throwing a baseball. Through repetitive use and a heavy workload, the UCL will indefinitely succumb to failure. The ligament will begin to fray and eventually tear, leaving pitchers in agony on the mound (see Joel Zumaya, Chris Carpenter, etc.) During the surgery, a new tendon, coming either from the wrist or hamstring is implanted and woven in a figure-eight pattern through holes drilled in the humerus and ulna bones. Sounds gnarly, I know first hand. After surgery, the player will be in a brace with limited mobility. Over time, the brace can be adjusted to certain degrees to promote extension with the elbow until the player has full flexion. Through rigorous rehabilitation and a 6-month throwing program, it’s not uncommon for pitchers to throw harder than they did before the injury. The chances of a complete recovery after the surgery are estimated at 85 to 90 percent. Rehabilitation takes around 12 to 15 months for pitchers and about 6 months for position players. The experience I’ve had with my pal TJ has been quite the travel. I suffered a blow-out of my UCL in the first game of Spring Training in 2010 with the Blue Jays. Two pitches into the first inning I felt and heard a loud pop. I felt a burning sensation throughout my forearm and tricep. I saw my career flash before my eyes. I trotted over to the dugout and held my head in my hands. A week later I awoke to being drugged up on painkillers and a brace on my arm. Months had passed and I was advancing into my throwing program and eventually started to throw to hitters. I went from a soft-tossing lefty, to a power pitcher. My velocity had peaked at 96 mph, and I was overpowering hitters with ease. Fifteen months after the first surgery, I felt that same pop. No rhyme or reason. Heeeere we go again. 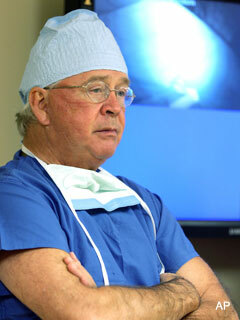 I saw renowned Tommy John specialist Dr. James Andrews the next day. In his own words, Dr. Andrews said, “I haven’t seen anything like this in 20 years.” Well that was refreshing. July 12th 2011. I found myself sitting in a hospital bed next to Terrell Owens, Matt Stafford and Joba Chamberlain. Nine months later, and here I am. Feeling as strong as ever, and close to facing hitters for the first time since July. While the Tommy John procedure hasn’t created teams of Frankenstein-like monster men, it’s the saving grace of many pitchers across the game. Close to 100 of the 800 or so pitchers in the league have undergone the procedure and have seen miraculous comebacks. But to all the pitchers out there, note that there are always ways to help prevent the UCL from “blowing up.” Through strengthening the Rotator Cuff and shoulder, pressure will be relieved from the elbow. Consistent long toss and post-throw therapy seem to do the trick. MLB reports: Welcome to MLB reports! Our fave starting question: who was your favorite baseball player growing up, that you most idolized and patterned your game after? Johnny Anderson: Being a kid growing up in the greater California Bay Area, I always was within a stones throw from Candlestick and the Oakland Coliseum. Seeing the A’s “Big 3” was quite the treat. I modeled my pitching after Zito, which might be why I got hammered around when I was younger. 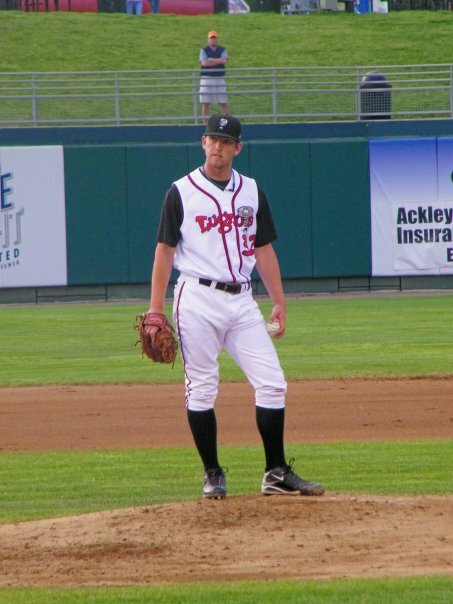 There was also another soft-tossing lefty that some may remember; Noah Lowry (Editor’s Note: BIG Lowry fan. Nice call Johnny!) We pitched almost identically to each other, so it was always a treat to see him throw. Johnny Anderson: With the Blue Jays graduating so many pitchers over the last couple years, it’s pretty cool to see guys I’ve played with over the years in the Show. With me being in and out of action the past couple years, I’ve been in the training room with a lot of pitchers that have been well established at the major league level. I’ve spent time around guys like Brandon Morrow, Shaun Marcum, Doc Halladay and others. It’s always fun to pick their brain and hear what they have to say. Johnny Anderson: Over all the years I’ve played, I’ve never won many awards or accolades. I’ve been the guy that’s always flown under the radar… and I’m completely content with that. I played 2 years at the Junior College level and without a doubt, they were the most memorable. We were so close to winning a State Championship, but one strike away each year. I was Conference Pitcher of the Year in 2008 and I cherish that honor more than anything thus far. MLB reports: When you first found out you were drafted, what were your reactions? Johnny Anderson: I previously held a commitment with Oklahoma State University before the draft in 2008. I knew I had a shot at getting selected pretty high, but had no clue what was about to take place. I had an agent/advisor that helped me with the whole draft process so that I’d be prepared if the right deal was in place. The day before, I had close to 20 different teams call me asking me if I’d sign. I gave all of them my agent’s number and let him do the negotiations. If the price and opportunity was there, teams were supposed to know that I was more than willing to forego school and sign. Lo and behold, my agent asks for an outrageous number and I slide to the 28th round. The Jays called my name and I was ecstatic. I knew my life was about to change FOREVER! MLB reports: You have gone through a very difficult and long baseball road. Tell us about your journeys through your various surgeries…and what is Dr. Andrews really like? I rehabbed for a year and I felt stronger than ever. My velocity was off the charts, and I felt like a completely different pitcher. The Jays sent me to Lansing last year and after a couple of games, I began to have the symptoms that it was going to happen again. Tenderness, loss of range of motion and unusual soreness. I worked hard to get back to a healthy state and then…it happened again. I was in complete shock. I fly out to Pensacola to see the famed Dr. James Andrews. He’s your typical Southern gentleman. He has a thick cajun accent and is definitely the best in the business. He sees my MRI results and looks dumbfounded. He tells me he’s hasn’t seen a tear of this magnitude in years. To quote him, he said “it was a 1 in one million” type of injury. Not only was my UCL replacement completely disintegrated, but I had torn my Flexor-Pronator tendon as well. It was going to be a long road ahead. As of now, I’m 7 months out of surgery and feeling stronger than ever. I’m feeling extremely confident about the upcoming season and ready to compete for a job. MLB reports: Tell us about your current offseason? How is the rehab going? Johnny Anderson: To state it frankly, I’m in the best shape of my life! (editor’s note: music to my ears. Always a great sign!) I’ve been throwing for close to 3 months pain-free. If all goes well I should be ready to join a squad before the All-Star break. MLB reports: Your 2011 season was very encouraging based on the numbers. It must give you great hope for the future. Johnny Anderson: I was pretty satisfied with how my season went, even considering how short-lived it was. 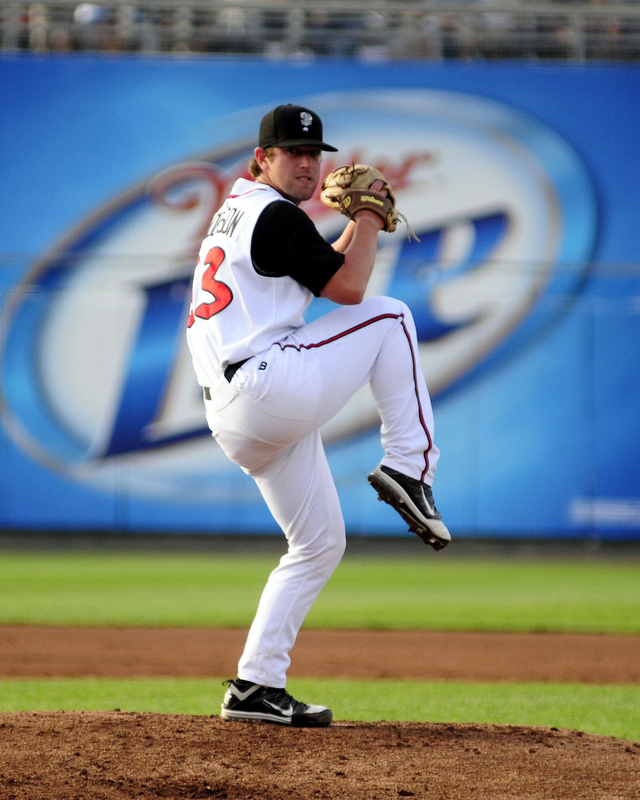 I took the mound with a bulldog mentality and knew that I could blow the hitters away with my stuff. If I can keep the same mindset- the sky is the limit. MLB reports: What do you have in your bag of pitching tricks- what do you throw? Johnny Anderson: I guess you can say I’m the prototypical lefty. I throw both a 2 and 4-seam fastball and complement it with a straight change-up and 12-6 curveball. The renowned Mel Queen (RIP) taught me how to throw a cutter. The same one he taught Halladay when he had his early career woes. It’s a tough pitch to master, but I’ve been working on it over the years. MLB reports: Any plans on going the knuckleball route? A lefty knuckler would be sweet. Johnny Anderson: I always like to be challenged. I’d love to play at a higher level, as I only have one game of experience at Hi-A. I want to show everyone that I can compete with the big boys. I may not be a high-acclaim prospect, but if given the opportunity I know I can perform at any level. MLB reports: What do you do for fun when you are not playing baseball? Best friend(s) on the team that you most hang out with and what do you guys like to do to chill? Johnny Anderson: During Spring Training me and Kevin Ahrens spend our off time confined in the team hotel playing Call of Duty. Yes, I’m quite the video game nerd. In the offseason, I enjoy working out and seeing concerts. There are tons of venues in the San Francisco area to see live shows. I love all sorts of music especially Electronic stuff. Not quite sure if this “dubstep” thing is a fad…for now I’ll listen. MLB reports: Have your visited Toronto the city yet? Have you met Alex Anthopoulos? How have you found the city and their GM thus far? Johnny Anderson: No! As a matter of fact I’ve never even left the States before. I’ve heard nothing but great things about Toronto and Canada. Especially the women (wink wink). I met AA in 2008 at our Instructional League. He knows more about the game than just about anyone I’ve ever met. Jays fans must be pretty excited about the future. This team is going up and up. MLB reports: What do you think of Toronto Blue Jays fans? Johnny Anderson: I’ve spoken to many through various social media outlets and I love them all. They are extremely passionate about their team and interact with all the players. What more could you ask for? 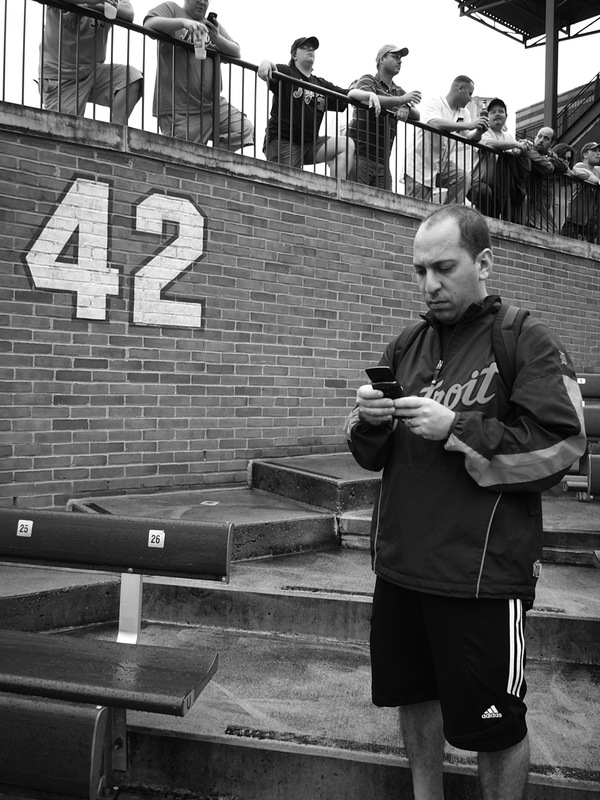 MLB reports: If you hadn’t picked baseball- what would you be doing today? Johnny Anderson: Baseball will always be around me, I love this game more than anything. In the offseason, I teach pitching to younger kids with a couple of other minor league guys from the area. I could definitely see myself being a coach sometime in the future. Also, my father is a recently retired Police Officer. My Plan B is to finish my degree and follow in his footsteps. Johnny Anderson: Anything fast and loud. I’ve driven a couple super cars in my time, and I can definitely say that I want one for myself. So if I ever make it to Toronto, you can count on me having a couple of Mercedes’ and American Muscle cars in my garage. MLB reports: If you could look into a crystal ball- where do you see yourself in five years? Johnny Anderson: Hopefully still lacing up the cleats! If my time has come, I can definitely see myself being a Police Officer and a High School pitching coach. Johnny Anderson: I’d like to thank MLBreports.com giving me the opportunity to share my story and the Blue Jays for sticking with me, even after everything I’ve gone through. I love all of my fans (the few I have) and interacting with them. I’ve become quite the Twitteraholic as of late and I can be followed at @jma32. I enjoy interacting with everyone, so give me a follow!